First up people - I have a secret to tell. Tomorrow night I'm announcing the biggest thing to ever happen to me as a nail blogger EVER! I'm so excited to share with it with you as I've been keeping this secret for months. So please come back tomorrow to see what it is. Something a bit fun today. 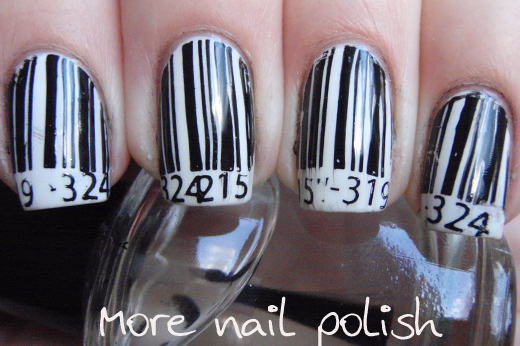 Here are some black and white bar code nails I created. I received a huge number of compliments from people yesterday and today on this mani. One even wanted to know if I could scan through at a checkout!. I made these using DRK-A Plate. It has the most perfect lines design that when I first saw it I new I had to do this mani. 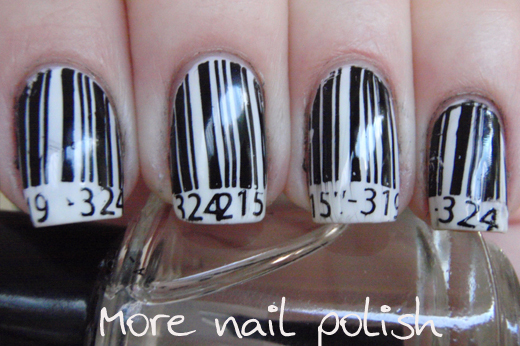 In fact I'm surprised I haven't seen another bar code mani using this stamp design. I painted my nails white using Ulta 3 Lily White and then when stamping, I just made sure to leave a white tip gap at the bottom. 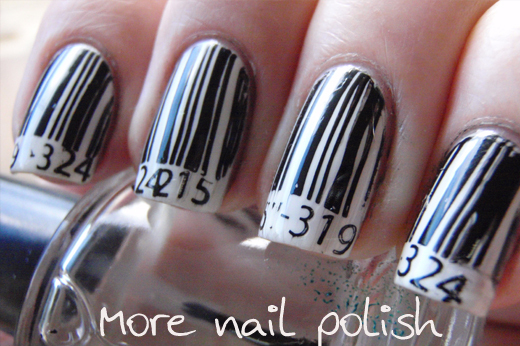 I stamped the numbers at the bottom of my nail in groups of two or three. The numbers are actually the plate numbers from the bottom of various Bundle Monster plate, where is it engraved with BM-215 or BM-324 etc. I struggled keeping the stamp straight on my nail, I still need much more practice. I also made a dreadful mess all over my fingers and cuticles because the stamp is so large. Konad black special polish is one nasty polish to have to clean up with. I also had some smearing from the top coat. So in reality there is lots of room for improvement, but I'm still really happy with how these turned out. See you all tomorrow for my exciting news. You're getting me all excited. Can't wait for tomorrow! Those are really amazing nails, btw! Oh I love these! They look ace! I agree wholeheartedly about Konad Black. If only there was an easy to get alternative. I have heard that Mash's black has a better formula for clean up. That is amazing. It would be funny if they accidently scanned at the supermarket LOL. omg the numbers idea is pure genius! Haha, love this! Very unique and creative!! I 've never seen anyone do this before either. Great going! Can't wait to see tomorrow's surprise! These are SO cool!! What a great idea! Ha, this is SO awesome! 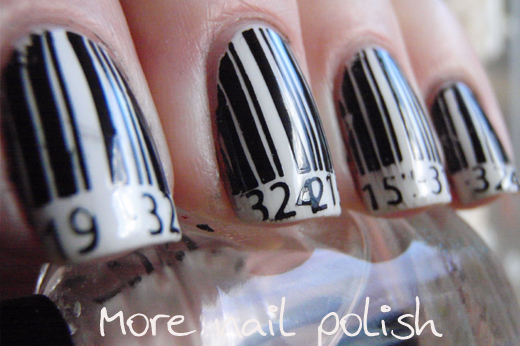 I thought about doing this very mani but I don't have the plate to do it with, I was debating doing it manually. I'm so glad you did it! I'm so happy to see that you're getting adventurous with your stamping, woot! Oh Cathy, I've seen it and I'm really excited for the unveiling!! I love it. Congrats:D And gorgeous mani! Very unique and awesome ♥. Such a neat idea to use the engraved plate numbers as a stamp. I love this mani!